If you are often in a time-crunch like me during the morning, you don’t have time to do both hair and makeup. Makeup always wins in my books (even if it’s just foundation and mascara), and a quick comb through usually does it for the hair. Now, if you have a few extra moments to spare, like I did yesterday morning (I teach a fitness class at 6:10 a.m. and then have to be at work at 9), I will spend some time making sure my locks look fabulous for the day. Having big bouncy hair doesn’t have to take up a lot of time. I’ve spent two hours doing my hair before (wash, blow dry, rollers for volume, then curling it), but if you don’t have the extra minutes to do that (seriously, who does? Me apparently…), then 20 minutes is all you need. For this look I started off with wet hair, but if you have dry hair already, you can cut your time in half because you don’t have to blow dry it. The shampoo and conditioner I used was Pantene Pro-V’s Smooth shampoo and conditioner, which contains Argan oil, so therefore I can skip applying the step of applying a serum. Hair should be about 80 per cent dry and at this point I like to apply a volumizing mousse to my roots. 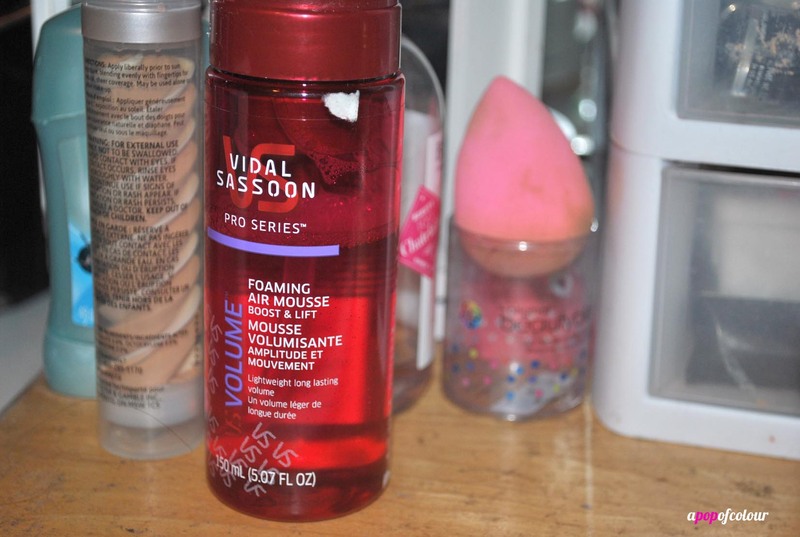 I used Vidal Sassoon Pro Series Foaming Air Mousse, then with a brush and your blowdryer, comb your hair up concentrating the air to the roots. Doing this creates volume. Next, turn on your curling iron, I used my Hot Tools one-inch curler with a clip because I find this is the fastest curler I have. I did my makeup between blowdrying my hair and curling it because I wanted to make sure it was completely dry before applying any heat to it. 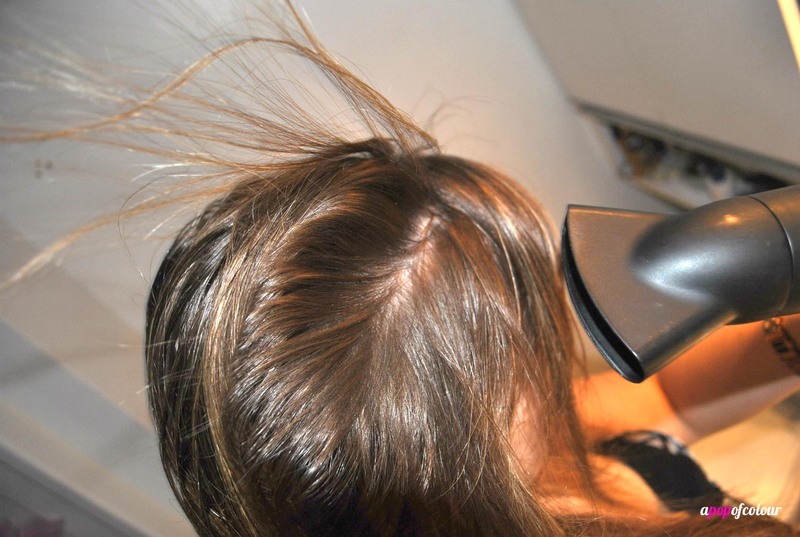 Don’t forget to use a heat protectant as well; I used Kenneth Bernard Thermal Protection spray. Now, for the curls, section off the top part of your hair and clip it on top of your head. Curl the bottom part in four sections making sure that the curl is going away from your face. Once that’s done, take down the top part and curl the rest. I would say this takes 10 minutes max. ; I have pretty thick hair so the top part definitely takes longer than the bottom. To finish up the look, I like adding some extra volume, so I will section off a piece on either side, spray it with hairspray, then tease it. 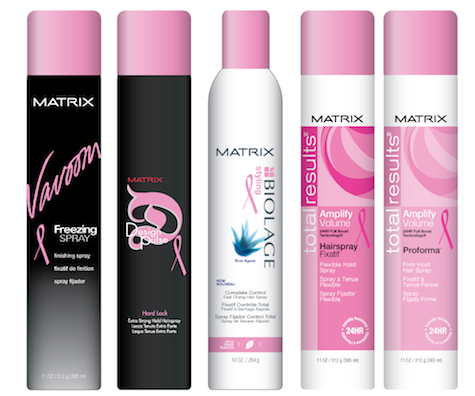 I used Matrix Total Results Amplify Proforma hairspray, which is a firm-hold, texturizing and finishing spray for extra lift and maximum hold. To set everything, spray your hair with a strong-hold hairspray, I used Matrix Design Pulse Hard Lock Extra Strong Hold hairspray, which locks in style without making your hair feel gross. And you are done! Let me know if you give this a try and how long it takes you. I’m a big fan of big, bouncy curls, and this is usually my go-to method when I’m short on time. 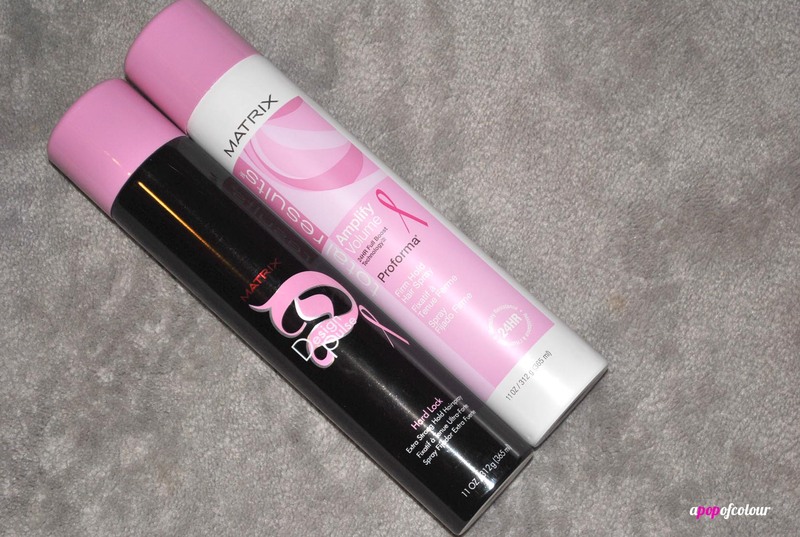 One more thing… the two Matrix hairsprays I mentioned, as well as three other styling products, have gotten a makeover this month for Look Good Feel Better. A portion from each can will be donated to the Look Good Feel Better Foundation, which addresses the appearance-related effects of all cancers affecting women. Created from a belief that if a woman with cancer can be helped to look good, chances are she’ll feel better, her spirits will be lifted and she’ll be empowered to face her illness with greater confidence. Please note, some of the products mentioned in this post were sent by PR. All opinions are my own.